7 Unique Outfit Ideas to Look Like A Pataka This Diwali 2016! We Indians celebrate a TON of festivals but even among all of those, Diwali happens to be one of the most anticipated and most fun. What with all those lights, camera, sparkles! So of course, the lot of us are running around trying to find THE perfect outfit to outshine even that phul-jhadi. As we all know, dressing up also comes with looking different / unique / better than everyone else. (please, you know you want to.) So what I’ve put together is a list of some fab trending Indian outfit ideas that will have you stealing the limelight this Diwali 2016. Keep scrolling to make an ethnic style statement that’ll certainly set you apart! We all know capes are trending this season so it’s no surprise that this one tops the list. What I love about capes is that you can pair it with anything, have it in any length and it will still make a fabulous statement. Sheer capes over your blouse are a great way to spruce up your lehenga. Pairing it with a saree really does look rather unique! Drape your saree normally and then have a matching or contrasting cape to go over it so the pallu doesn’t disturb the design. With the cold setting in, it’s the perfect outfit to don this Diwali! The length of the jacket also adds a classily dramatic touch to your ensemble. I personally love the sheer jacket with embroidery over simple lehenga. 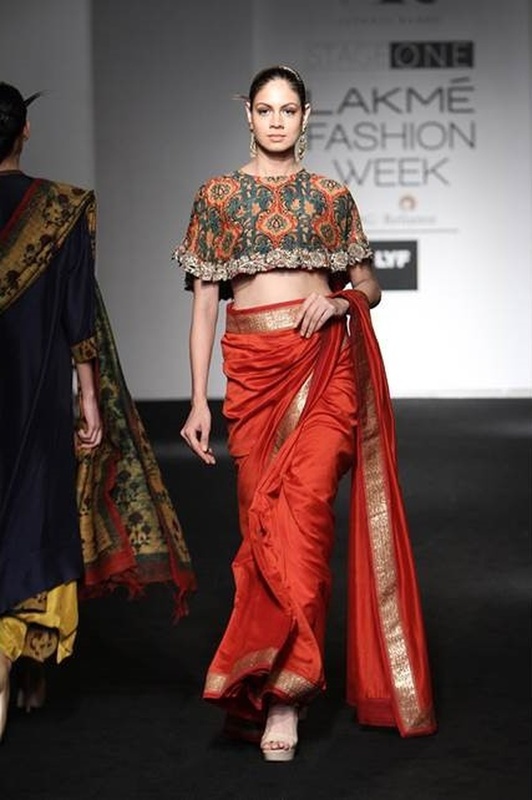 Similar to your new-age palazzo pants with a kurta but with a lot of gorgeous work and a festive touch. Maybe I just have a thing for sheer, but look how stunning those neutral-coloured sheer pants look with the black embellished jacket-kurta! But if you think this is too risqué for the fam on a traditional Diwali day, not opting for sheer looks just as gorgeous, as you can see. I would suggest that you focus on an elaborate border. Okay, I know I said all girls love dressing up, but this one’s for those who like to play it a little casual and comfortable (but yet stylish). Hate having to make sure your saree pallu isn’t helping with cleaning the floor or your lehenga isn’t getting stuck under someone’s shoe? Dhoti pants/dresses are here to save the day! So comfortable yet so chic. Opt for fun, vibrant colours, dramatic prints or some embroidery to make up for the casual vibe. If you’re confused between a lehenga and a saree, then your search ends here. Lehenga sarees are perfect for you! The sweep of the pallu and the flare of the skirt adds just the right amount of festive drama you need this Diwali 2016. Plus, they happen to be trending this season! Anyway, I’m talking about ethnic wear that is otherwise known as a churidar set. These long, straight-cut kurtas starting trending a year or two back but I don’t think they’ve really gone out of style. Of course, the runways change every few months, but I think the commercial market still looks pretty great with these. They have this sophisticated elegance that would make anyone look great. For all the fashionable ladies lazies. Super easy to wear! You literally just have to throw on a piece of loose fabric, maybe a few accessories and you’re good to go. It could be worn as a desi dress. Great for those who love an indo-western touch to their outfits.